And Mercy Overflows | The Size of a Mustard Seed. Matthew 17:20. The Size of a Mustard Seed. Matthew 17:20. As the day continued, I became even more fascinated by one particular fact: God does so much to show us and give us His love. He called on Saint Faustina to share His message of mercy in a very powerful way. She was a young, humble, polish sister who went on to become Christ’s “secretary of mercy”. Jesus came and appeared to her several times and gave her a mission saying: “I am sending you with my mercy to the people of the whole world. I do not want to punish mankind, but I desire to heal it, pressing it to my merciful heart.” Saint Faustina wrote of all of this in her diary, Divine Mercy in My Soul, which has spread our Lord’s message throughout the entire world. While reflecting on some of the things Christ spoke to this saintly sister, I clearly saw how God’s greatest action that display this message was to die for us on the cross. He endured all the pain and suffering to redeem us and rescue us from sin. What poured forth from the cross was His mercy. It was a victorious mercy! And after He rose again and returned to the Father He left with us the seven sacraments. Each of these was instituted by Christ so that He may be with us until the end of time. We see Divine Mercy at work most powerfully through confession. God’s mercy is a just and fair mercy. He is there, waiting for us. Longing to, as he told this great saint, heal us in His mercy. It is all which He desires to do. We must only trust in this message, knowing all the truth which is within it. Christ is always reaching out to us, trying to get us back to Him. But it is our free choice to run to Him. 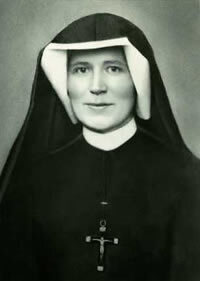 To respond to His call, a call that He beautifully showed through St. Faustina. The amount of things which could be written about this message is endless, so we are sure to return to this beauty. Let us pray for the grace to know His mercy more and more. To always have the grace of a good confession so that we may live with Christ. To follow the mission that He is calling us to, whatever it may be. Let us pray to open our heats to His love shown to us through this message and the cross. St. Maria Faustina, Pray for us!